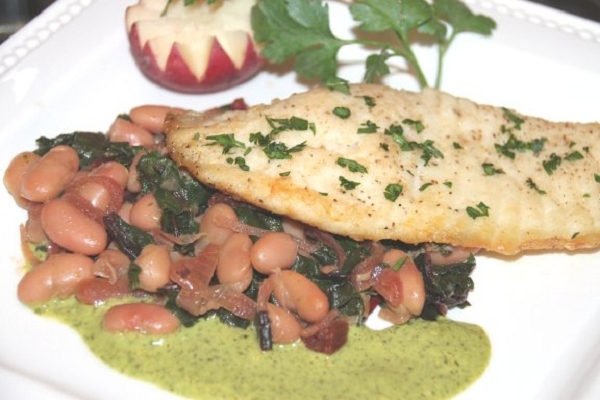 Fresh tilapia or similar whitefish lightly pan seared with a lemon vinaigrette served over a healthy bed of sauteed Swiss chard and beans. This dish was very different than anything I ever have had before. It only took 15 minutes to prepare, and it came out to perfection. We have been quite spoiled by the last four meals, because we only had to bake them, so this entree requires a little more preparation, but nothing like Home Chef or Hello Fresh. Maria has done it again...delicious. This dish was so yummy. We wanted to try something different and found this dish to be very tasty & filling. Having never tried Swiss chard, I wasn't sure what we were getting. However, it was such a nice lovely, light, but filling meal and we tried something new. Prep was fairly straight forward and quick. The fish portion was very generous. I hope you list it again as an option. Count us in!! 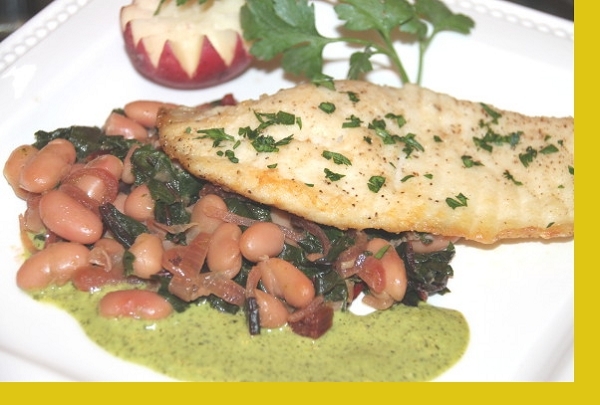 My children loved the fish's flavor and one even liked the beans which I thought had fantastic flavor. It took a bit of time to prepare so not the best if you're hurrying on a school night, but we'll absolutely order again. Easy to prepare; very healthy; neither of us had eaten Swiss Chard before, but we really liked it. Unusual, easy to prepare, delicious, and very healthy dinner! This fish was delicious as was the sauce. The combination of white beans and Swiss chard was unusual and tasty. The fish was incredibly fresh! Loved every bite of this dish. Only took a few minutes to put it all together.